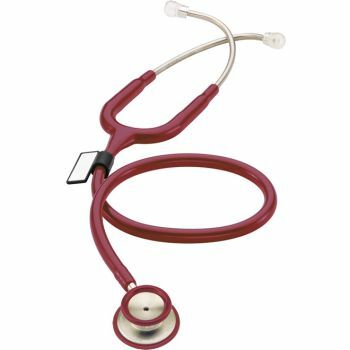 Constructed from acoustically-superior stainless steel, the MDF® MD Oneï¿½ Stethoscope delivers accurate auscultation of heart, lung, and Korotkoff sounds with acoustic integrity and clarity. An ergonomic design ensures comfort for the doctor and patient, even during extended use. The MD Oneï¿½ is a premier diagnostic instrument with unmatched performance, durability, and aesthetics. ErgonoMaxï¿½ Headset:Hand polished, pre-angled stainless steel headset features a patented internal dual-leaf spring construction for durability and custom fit. Soft silicone ComfortSealï¿½ eartips (available in standard and small sizes) are clear for hygienic purposes and conform to the ear to seal out extraneous noise while ensuring comfort during extended use. Patented SafetyLockï¿½ eartip adaptors lead the industry in user safety. Included Accessories: 2 extra sets ComfortSealï¿½ eartips, spare ultrasensitive diaphragm, and ID tag.